Last Saturday morning I climbed to the top of Galston Gorge at dawn. This is what you see when you get there- if you are lucky! A morning mist that sometimes fills the whole valley: awesome. From the top of the ridge the track runs through open bushland. 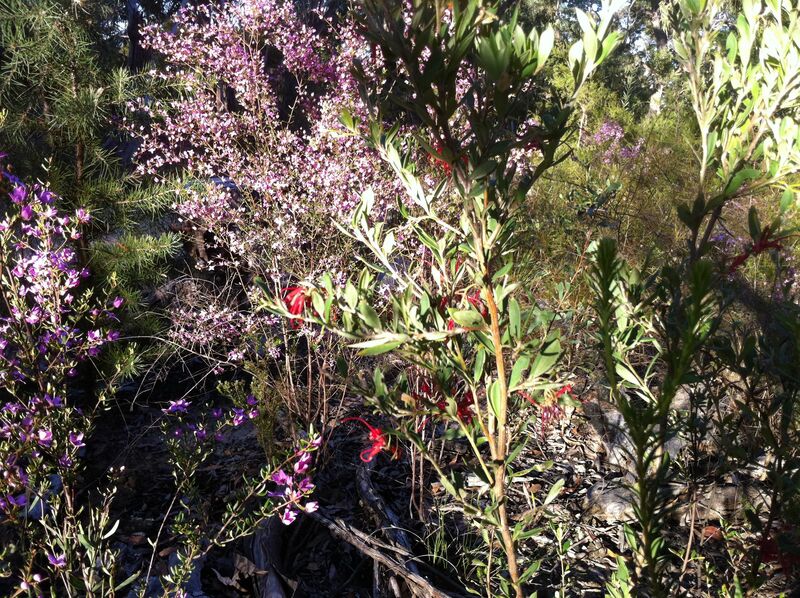 This is where I saw the very first flowering of the Australian Wax Flower (Eriostemon Australis). This is one of my favourite plants: it has a soft, textured, waxy petal and varies in colour from deep to pale pink: fabulous creation! This is the famous Black Boy spoken of by Soldier Killam on page 42 of That Deadman Dance. 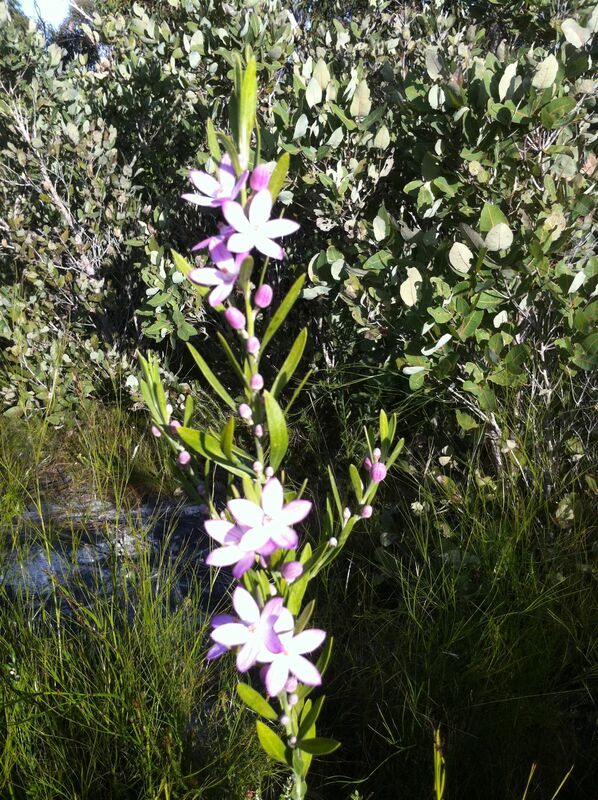 This one is in full flower. 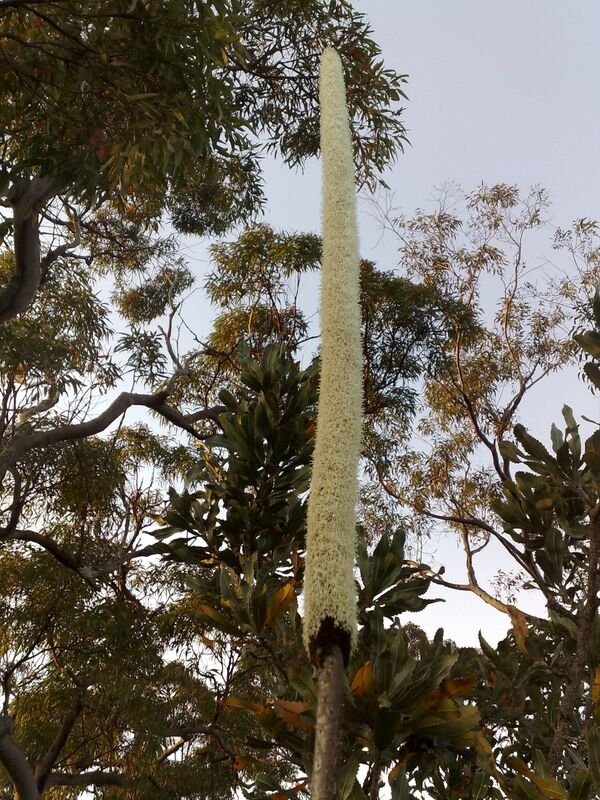 It was covered in bees and smelt strongly of honey. I watched birds land on it too, making it swing around like a mast at sea. 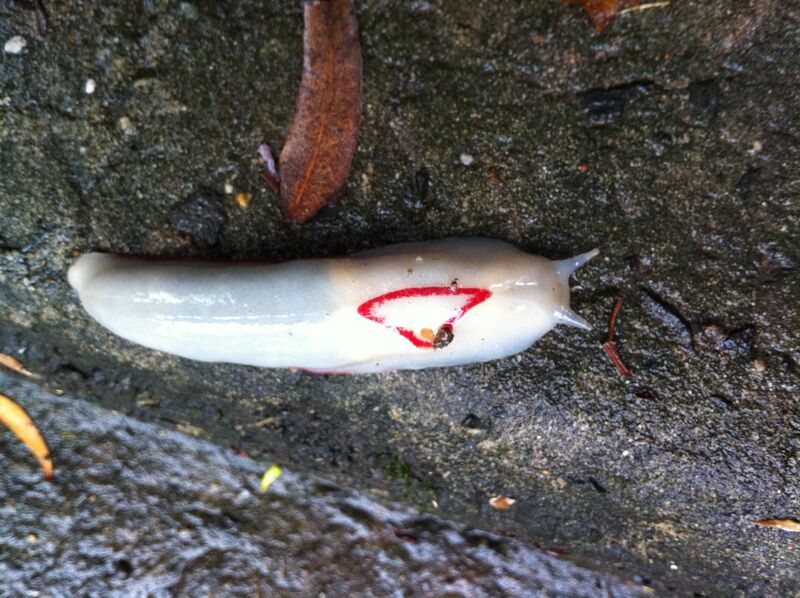 This is Australia’s famous triangle native slug. It breathes through the triangle rather like a whale breathes through its blowhole. I snapped this slug on the road just outside my place on a wet morning. Is that the spear of a blackboy? Are you making this up about the Triangle Slug and its blowhole ? I think not. Truly fascinating. I am not a scientist. But this is what I have read about this amazing triangulated being living on the surface of our antipodean continent. 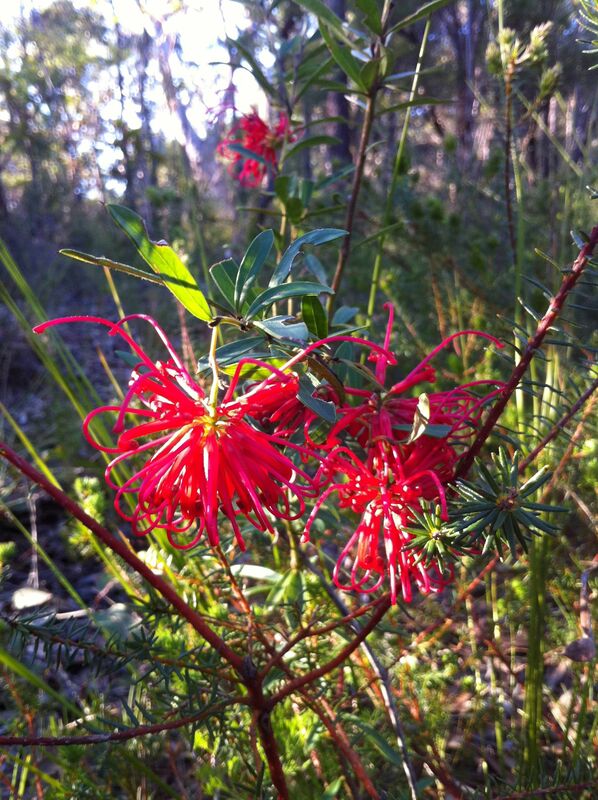 Thanks for the wonderful photos, Michael.I,ve just spent the long week end with an old friend bushwalking in Blackhealth,which was rejuvinating. 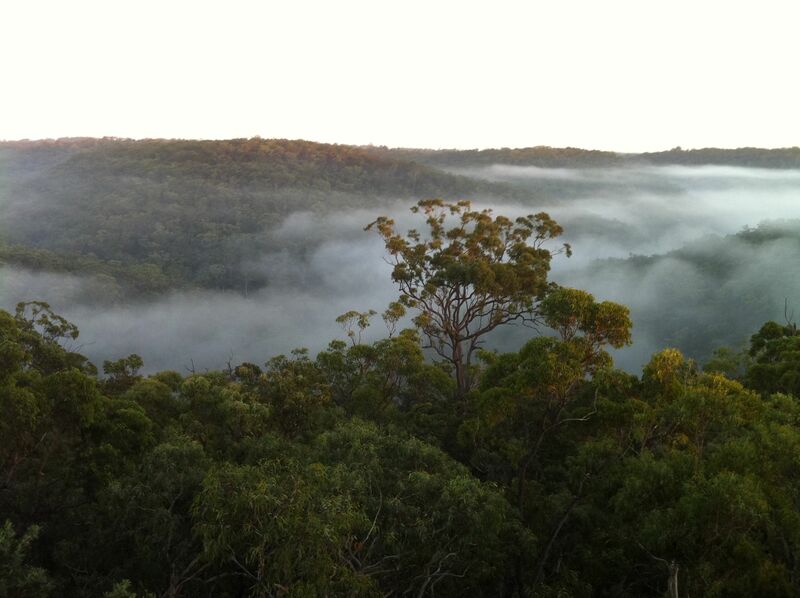 I lived in the Blue mountains for ten years, about 2 years ago and had forgotten the breath taking beauty.Your misty morning photo reminds me of Blackheaith.The bright grevillas are gorgeous.But You have more energy then me to make it at the top of the mountain,especially in the morning.I admire your appreciation & enthusiasm for life. It reminds me of when I went to South Africa in 2010. I went to a place called God’s Window which reminds me of your first picture. You give us beautiful evidence of ‘what’ – I am impressed that you had time to stop and notice the small things that a serious walker I fear would walk past, but my mind is filled with questions of ‘how’! I blame that on my art school training.